New LED technology anti-collision lights. When the door is turned on, it flashes rapidly, warning the rear to avoid the accident occurred. New LED technology anti-collision lights. When the door is turned on, it flashes rapidly, warning the rear to avoid the accident occurred. Wireless, just paste on to your car door easily. First 6 seconds "rapid flash" mode, best warning to the rear of the car. After 110 seconds lighting, it will be off automatically. Then the red cover still can be used to reflect light to remind the rear. 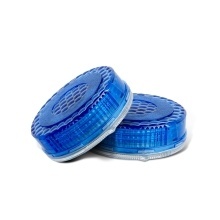 Waterproof cap and build in high-tech component sensor, long service life. Powered by button battery, easy to replace by yourself.